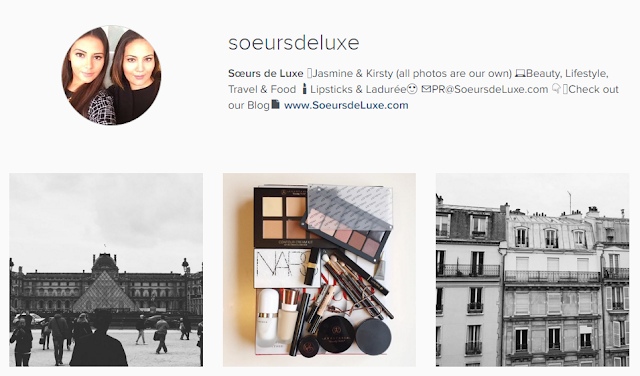 This is the third week of our Instagram transformation and regular roundups! To see last weeks, click here. Kirsty visited Paris, so again, a very Parisian theme last week! View of Le Louvre, always one to visit when in Paris! FOTD - including Anastasia Beverly Hills, Ingot, NARS, Lancome, Chanel, Benefit and Marc Jacobs. Parisian buildings are just beaut! a LUSH visit was such needed! Love their sparkly christmas bombs - Sparkly Pumpkin, Five Gold Rings and Magic of Christmas - perfect! Definitely recommend a trip to Les Deux Magots for a hot chocolate in this weather! Tad obsessed with NARS. Nothing better than Blacks and Nudes. Featuring NARS, Bare Minerals, Marc Jacobs and Bobbi Brown. Just in love with Parisian rooftops, especially with Sacre coeur in the background! The Galeries Lafayette Gourmet is a breakfast obsession. Sticking with the Parisian theme, the NYX shadow palette in Parisian Chic is to die! The roof in The Galeries Lafayette is absolutely stunning! Marc Jacobs is just perfection. Jasmine took a tour of the Houses of Parliament, London. Big Ben's actually kinda pretty! Kirsty's weekend in Paris was like a dream! Angelina hot chocolate cannot be rivalled. Follow us on Instagram to keep up with us daily. Let us know what kind of images you'd like to see more of! Let us know in the comments below!